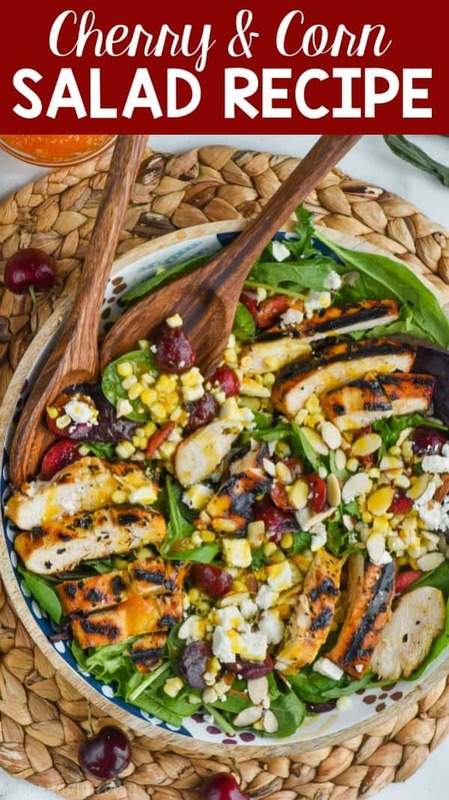 This Cherry and Corn Salad is made with roasted corn, fresh cherries, and the most delicious marinated chicken. 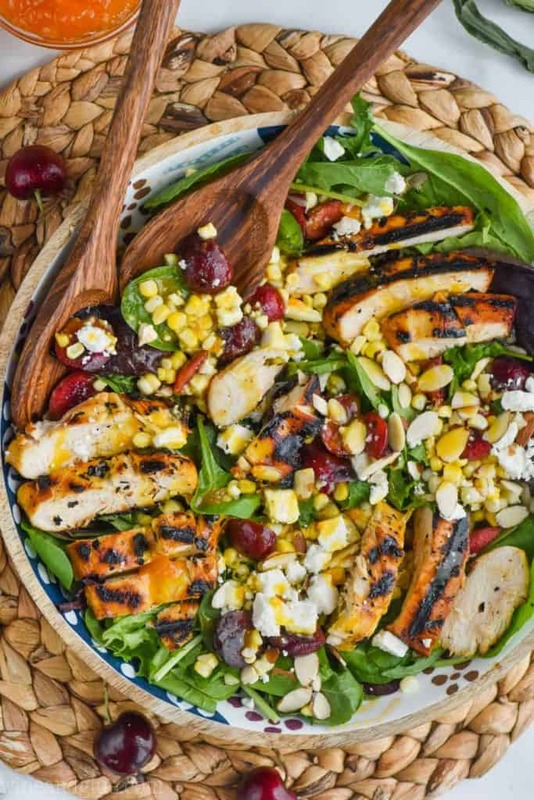 The ingredients to this easy corn salad recipe scream summer! Grab a glass of strawberry lemonade and make this your dinner on a summer night. This week I’ve been planning Quinn’s birthday party and I’m kind of in shock that she is going to be seven. I feel like I was juuuuust pregnant with her. The summer that I was pregnant with her was rough! Not only was I pregnant during the summer, but it had been just a few short months since we lost Elliot. I was so terrified during my pregnancy with Quinn. We didn’t have any clue that anything was wrong with Elliot until I was about 37 weeks. So even up until the very end with Quinn, I was so very scared. So I kind of just had to make a summer salad with fresh cherries in it! And since fresh corn salad recipes also make the perfect summer entree, I knew I had to make you this Summer Cherry and Corn Salad. This is not your typical cold corn salad recipe. 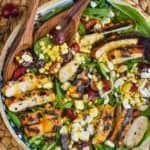 There are so many layers and flavors to this salad recipe. I’m totally in love with it. It would be a great side dish without the chicken, but I love adding the chicken and turning it into a full meal. 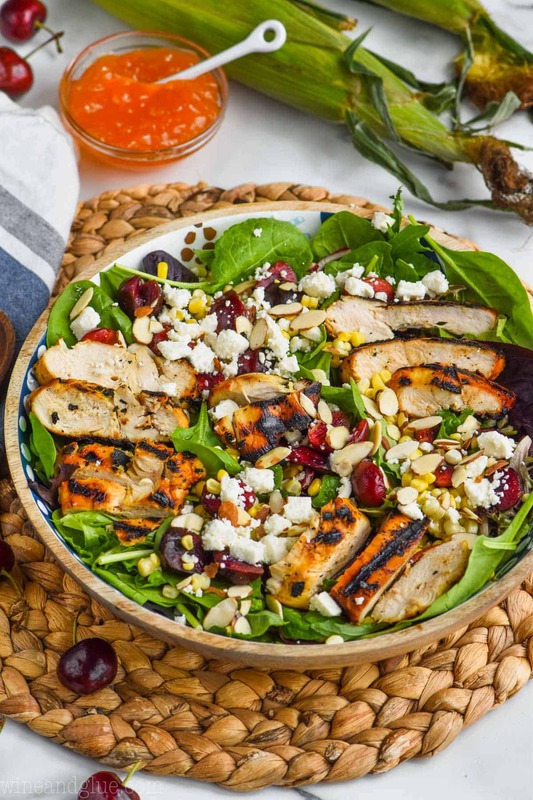 Start with a bed of fresh salad greens. I really love buying mixed greens, but if spinach is your thing, grab some of that for this recipe. 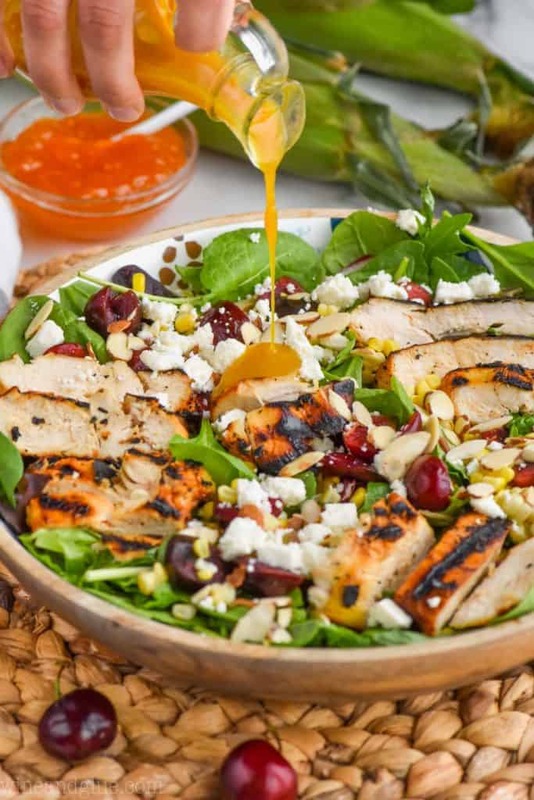 Next you need some Apricot Mustard Marinade that you can use on some chicken and grill it up. You will want some fresh cherries. Give them a rough chop and make sure to get rid of those pits. You will need fresh corn of course. Throw it on the grill while you are grilling up your chicken! Then you need some feta and sliced almonds. Finally, because you are so smart (go you! ), you reserved half of your marinade before throwing your chicken in it. Thin it with a little olive oil and use that as your dressing! This Apple Bacon Salad is so simple, but has so many great flavors to it. This Southwestern Steak Salad is going to become a favorite of yours! It also has corn in it, a crazy good steak marinade, and a jalapeño ranch dressing! 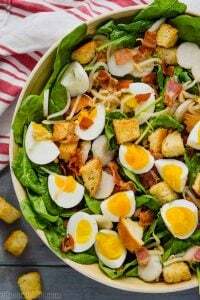 This I love this twist on a classic cobb salad with the Cajun Cobb Salad! 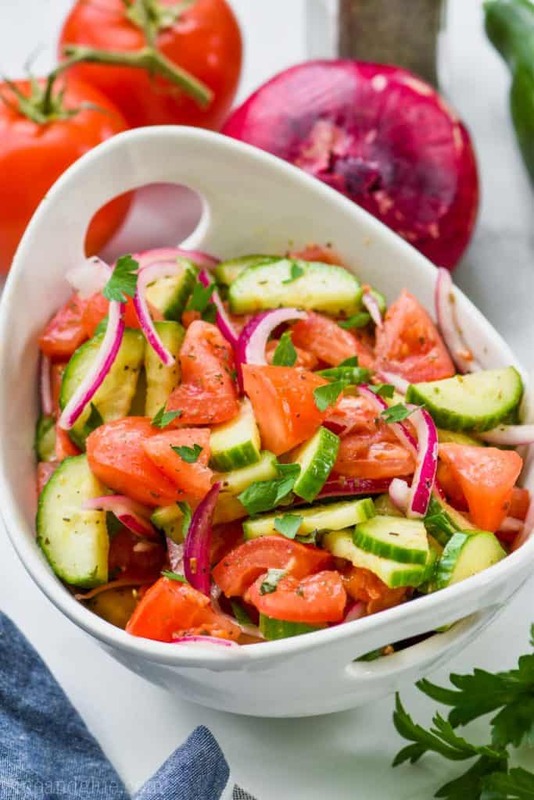 Tell me your favorite salad recipe to eat in the summer! Prepare the Apricot Mustard Marinade according to instructions. Reserve half of it before combining the other half with the raw chicken. Marinate the chicken for four hours. Grill the marinated chicken for about three minutes on each side or until they register 165 degrees internally. Slice the cooked chicken. While the chicken is grilling, peel the corn and throw it on the grill next to the chicken, turning it after a minute or two so that each sides gets a little charred. Remove the corn from the grill and carefully cut it from the cob. 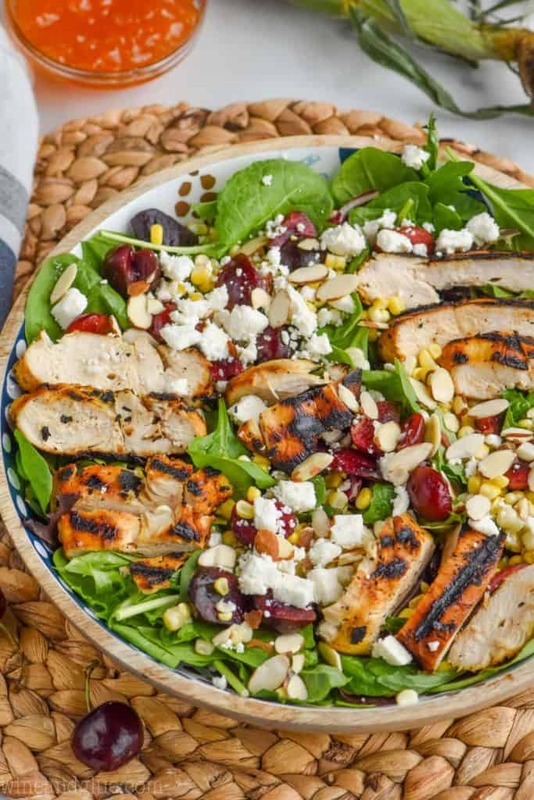 Layer the remaining ingredients, the greens, grilled corn, cherries, feta cheese, sliced almonds, and finally the chicken. 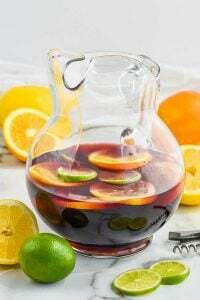 If the reserved marinade seems too thick, thin with a little extra virgin olive oil, about a tablespoon at a time, until you get the desired consistency. You want to cut the chicken in half (as if you were butterflying it, but cut completely though). This will help the chicken grill faster. It's very important that you reserve the marinade and have some that you have not mixed with the raw chicken. This will be your salad dressing. Do not use any marinade that has touched raw chicken for anything after marinating. 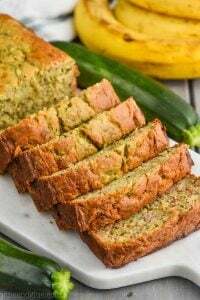 Other great summer recipes you will love! 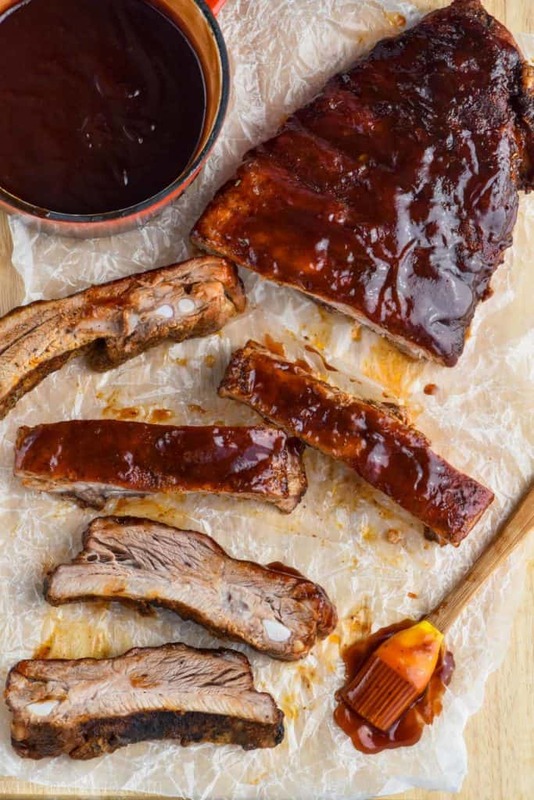 Never found the recipe for apricot marmalade marinade. Just went in circle after circle but no recipe showed up. Why does this keep happening? 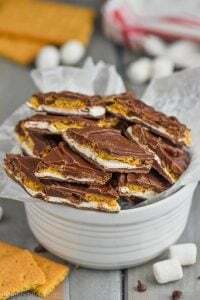 I find a recipe I like and BAM! something always shows up where am unable to find part of the recipe. Hate that!!! 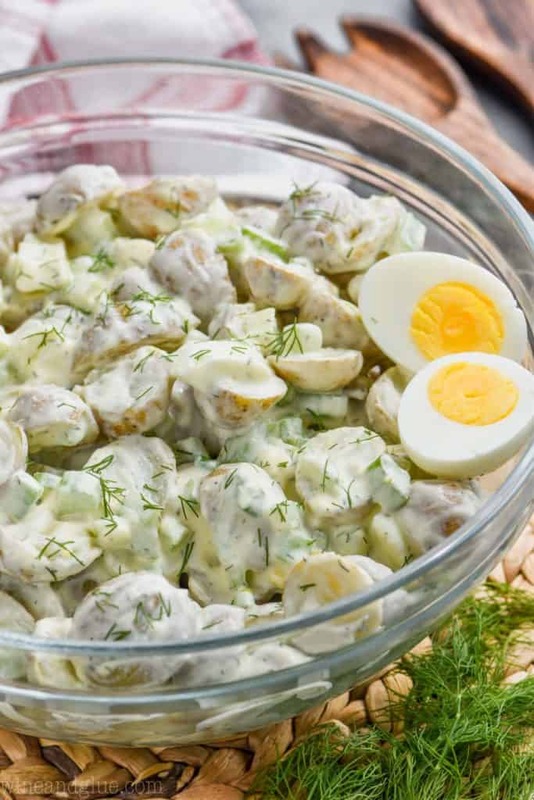 I wanted to reach through my computer screen and grab this salad, it looks absolutely, divinely delicious! I have been following your wonderfully humorous and insightful posts and have loved your easy, and healthy recipes. Thanks for sharing! Angela, I can’t even tell you how much I needed this blog comment today. Thank you a million times over for taking the time to leave it. Seriously.